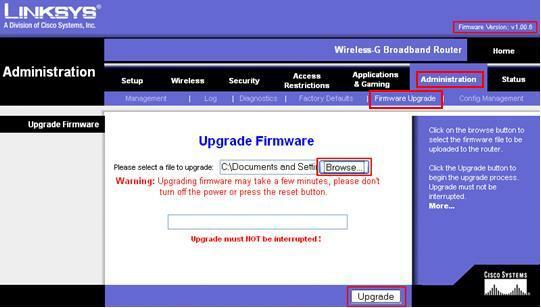 I will show you how to do Linksys wireless router firmware upgrade in this article. Usually by upgrading the firmware, it would fix the existing router bugs and provide additional router features. 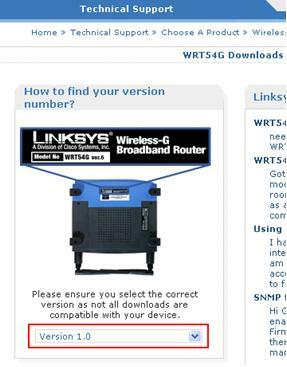 For the steps I show here, I will use old Linksys wireless router WRT54G as an example. 1) Go to this Linksys download page, key in your wireless router product in Search box or click on View product list to locate your wireless router product. The one I will look for here is wireless router WRT54G. 2) On the wireless product download page, select the existing firmware version of the router, then proceed to download the latest firmware. For the example here, I select version 1.0. Note: You can log on to your router management page to check the existing router firmware version. 3) After successful firmware download, log on to router management page, click Administration tab and proceed to select Firmware Upgrade, do file browsing to select the downloaded firmware (the file name should end in .bin) and click Upgrade button to do firmware upgrade. Upgrading firmware may take a few minutes, so please don’t turn off or reset the wireless router. Note: I would also advise you to backup the existing configuration by going to Administration > Config Management -> press Backup button, so that can restore existing setup if you need to reset the router to factory default setting later (if you are unlucky). -> back to top of "Linksys Wireless Router Firmware Upgrade"! !